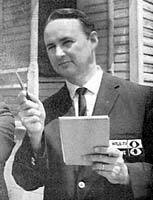 Bill had been news anchor in Montgomery, Alabama and covered the civil rights movement there alongside Frank McGee. When McGee was hired on at NBC News, McGee tried to persuade Henry to come to New York with him but Bill didn't like the idea of living in such a big city. He remained friends with McGee, who became a television news legend. Bill was brought to Channel 8 in 1962, when the station decided to get serious about news and go head-on with ratings leader WTVT. He was news director at WFLA-TV from 1962-1976. During his tenure in that capacity, he anchored the 6 o'clock news and sought to strengthen the role of minorities in the station's news area. In 1977, he became WFLA's Public Affairs Director and moderated several weekly news talk shows. He also oversaw and narrated special news documentaries. His reputation as a Tampa journalist remained untarnished and he was held in esteem by everybody in the news business. He died at the age of 66 of a brain hemorrhage just a few months after he retired in the mid 80's.